Cheyanne shares her OPINION on why she'll no longer be attending Shuto Con. I have been thinking for a few months now about how I could write this piece and not sound like a jerk. Conventions are hard to run, and there’s a lot of nitty-gritty stuff we as attendees just don’t understand about the inner workings of our favorite events. However, I feel as if now is the time for me to voice my concerns about one specific convention. This piece is, at its core, my opinion. Ultimately, you may wish to support whichever convention you want, and I will respect that. But I will no longer attend Shuto Con. Here’s why. We all complain how much money it is to go to conventions, but we need to consider how much it takes to run one of these events. Most conventions survive purely off attendance and merchandise sales at the event itself. The con chair most likely takes a chunk of money for themselves. I have never once heard of someone making their primary living from one convention alone, especially one as small as Shuto. Granted, the con chair does own her own plush business (we’ll get to that one later), but it seems as if Shuto is her entire life. And I completely respect this. For what it’s worth, you can tell the convention is one that she and countless others care so deeply about. It’s the first event that I could find that openly said it was LGBT friendly, and it was the event that kickstarted my panel business. But there’s a few issues with how money seems to be handled at this convention. For starters, they raised badge costs by $5 this year. This is nothing to us, but everything to a convention. If every single one of the 6387 attendees from 2017 paid an additional $5, then the convention would generate an additional $31,935. Wow. That’s a lot of money! Enough for someone to live off, really. And enough money to cover the debt Shuto was in. See, this raise in costs was due to an unforeseen bill from the Lansing Center, where the convention is hosted. The con chair said that they were $6000 behind in payments. Great! If you use some of that nearly $32k generated next year from badge sales, you’re still seeing a net profit of $25,935. Even if you factor in the additional $3000 she said would help bring an additional music guest, you’d start Shuto 2018 with $22,935, assuming convention attendance stays the same. When you average these numbers together to get the mean growth rate of the convention, you get an average growth rate of 1.14x per year, or a 14% increase in attendance from year to year. Yes, growth has stagnated over time, and even decreased in 2016. This means in 2017, attendance only just barely grew from the attendance numbers of 2015. But why could a convention decrease in attendance like this? Well, one reason has to do with money. See, 2016 marked when everyone was realizing how much money Shuto actually cost to attend. The hotel began requiring payment before the convention, and honestly, panelists didn’t want to attend because they weren’t being compensated fairly (we’ll get there too, I promise). So, if we use the mean growth rate of a 14% increase from year-to-year, we can guess that a solid number of attendees would be just about 7,281 attendees. Heck, we could assume last year’s growth rate of 2% growth and come up with 6,514. For the sake of my argument, we’ll use the smaller number. We still have an additional 157 attendees from last year. If we account for $55 per badge (assuming some bought early, some buying at the door), the convention should still make $358,270 on door sales alone. That’s… a lot of money. Obviously, the venue is expensive, and I could find no reliable statistics on how much it costs to run a private event there. However, there’s another secret form of revenue we have yet to talk about. Vendors and Artists. See, they pay an ADDITIONAL fee to set up shop. There are at about 80 normal artist alley tables, 26 “premium” artist alley tables, and 48 dealers spaces, according to the respective artist and dealer hall contracts. If you take into the $150 for the normal artist tables, the $250 for the “premium” ones, and the $350 for a dealers table ($400 if you want a corner booth, but we’ll leave that detail out for these numbers), you’re generating $12,000 from the normal artist alley tables, $6,500 from the “premium” ones, and $16,800 at least from dealers (I didn’t include the extra for corner space, sue me). Overall, an additional $35,300 is generated from these sales alone. Add that to our projected budget of $358,270 from the badge sales, and you’re at $393,570 in revenue for the convention. There are no numbers, that I can find at least, that indicate how much arcade companies pay (or receive?) for setting up space and shop at the convention, and I have no idea how much money it costs to rent the Lansing Center. However, what I can tell you is this: If the $6000 was such an issue, that money could have come directly from the badge sales of the project 157 people to attend this year that did not attend last year. Nearly $7000 would have been made on their badge sales alone. But instead, the con turned to Kickstarter. Which, on one hand, I agree with. There were many people who genuinely wanted to donate to a convention that they love. However, stop soliciting, and start advertising. I must point out, my number crunching is all my own. I reached out to the con chair Stefanie Shall for an interview and to get more information about the detailed finances of the convention, but she declined, asking me not to publish a piece about the convention. The con chair owns her own plush business. Ironically, I bought my first piece of merchandise from a convention at her booth once known as Otakumals. He was a con germ, I hold him close to my heart. Anyway. Back on topic. Today, she uses Kickstarter to primarily fund her plush business. I’m going to give you all an account of what it was like backing her Kickstarter. On Jan. 10, 2017, I backed her Kickstarter. I spent $36 to help out an artist, and felt like I was doing the right thing. I have received 65 project emails. The Kickstarter I backed ended in the winter! Why, you may ask, am I still receiving emails? Simple. 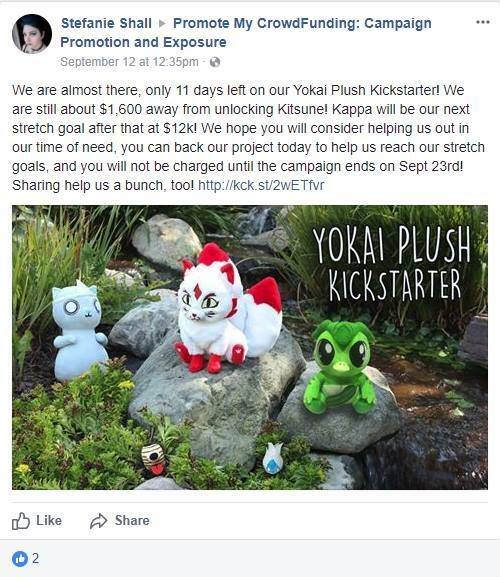 She is using her former Kickstarter backers as a potential audience to market her OTHER Kickstarters (some of which aren’t even done under her Creepy Kawaii business, instead advertising for her and her girlfriend’s business, Haunted Star Studios). And you know what REALLY gets my blood boiling? She said, in her most recent backer email, if she doesn’t get the last $400 needed, all backer tiers will disappear and she’ll cancel the Kickstarter (WITH NO WAY FOR BACKERS TO KNOW FOR SURE THEY HAVE ANY SECURITY THAT THEIR PRODUCT WILL BE SENT TO THEM!!!!). Phew. Had to get that one out of my system. I don’t mean to attack the con chair as a person. Quite the contrary. She is very cordial with talking about her convention and, in nearly every professional encounter I’ve had with her, it’s gone well! However, I just have a feeling I’m going to end up on the ban list for writing this article. But, dear readers, I have a feeling you should all know why, and the REAL reasons why, I won’t go out of my way to go to this con again. Now, the subhead for this section mentions “other” emails. What are those, you ask yourself? Some attendees wanted a way to donate to Shuto. Great! Those attendees were also on Facebook, so why did the donation need to be email blasted to anyone who has bought a Shuto badge online since 2014? Me. I didn’t need it. Nor want it. And many (and I mean MANY) people were angry at how this was handled. 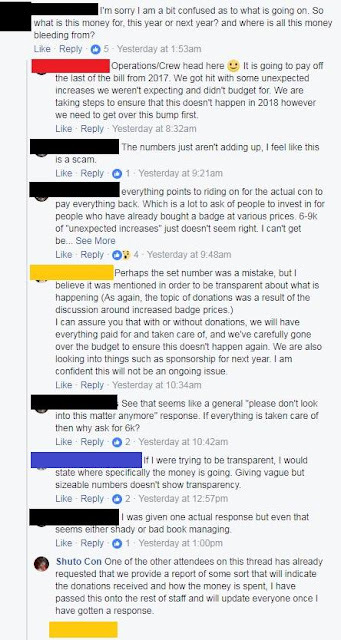 There were posts from the con chairs and staff members, with many attendees fuming in the comments (some of them over rather little things). Take a look at the original post and comments that weren’t deleted here. “Since so many attendees have expressed an interest in donating towards Shuto Con to help us raise money for our final Lansing Center bill, we have decided after looking at several different platforms to open up a donation option on our Eventbrite page. We are currently hoping to raise at least $6,000 by Oct 11th so we can pay our final bill by Oct 15th,” the email asking for donations wrote in part. 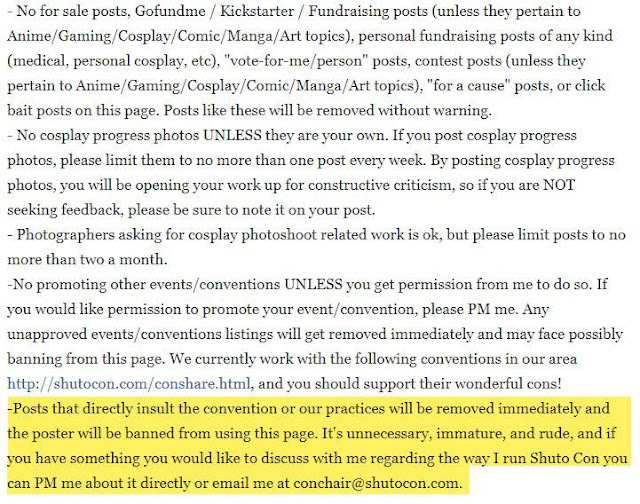 Speaking of emails, someone also hacked an outside server to LOOK like the official Shuto Con email to make threatening and harassing emails to attendees, making fun of the con chair and the whole donation dilemma. Ultimately, the donation problem ended with just under $700 raised, and the remainder of the balance covered from two “private” donors. No word if those who donated got the prizes they were offered in return for their donations, as nothing regarding it has been posted on their social media since the fundraiser ended. Shuto has a rather… shall we say… unique convention scene. This convention has, by far, the longest list of rules of any convention. Some are comedic (such as the infamous rule banning didgeridoos over 12ft), to some banning anything considered “lewd”. Some rules even ban sitting or standing in large groups for long periods of time. That’s… that’s like, 80% of the con though. Obviously, some attendees were ticked off about these seemingly insane and overbearing rules. This rule of large groups? That applied to even the famed dancers that entertain us throughout conventions for free. This ban was made just weeks prior to the 2017 event, and left many dance crews left out. Some, however, were given special permission to perform in the hallways. The security hired by Shuto Con (though not convention staff photography) enforced these rules… and things got a bit out of hand, from the attendee perspective. Personally, they made me and my friends walk AROUND the Lansing Center in the cold, at night, because they personally decided one door was shut with no warning. I heard of people going out to smoke right outside of that door, and not being let back in. And don’t forget Sunday, where at 6:01 we were getting yelled at because we decided to pee before driving two hours I home. I know, we’re such rule breakers. Another set of rules that caused anger was the rules centered around photography. The security got a bit overzealous with their weapon check policy, and made you check any and everything. Plastic empty watergun? Gotta check it. A tripod for your camera? Gotta check it, apparently. By “checking” it, I mean “putting a zip tie on it so tight you can’t remove it without damaging your equipment”. Also, the convention changed the photography policy on the website during the convention to prevent photographers from taking up space in the hallways. Just this past week, an attendee was kicked out of the convention’s Facebook page for posting a photo of himself cosplaying as the convention’s mascot with a sign asking for donations. So, I’ve mentioned a few times now that I am a panelist. At most conventions, panelists receive some sort of reimbursement for their time, whether it be through badges/badge discounts or monetary reimbursement. Shuto used to follow a similar policy. Up until 2015, you received a badge for hosting so many panel hours. From what I heard, their panel coordinator changed, and this policy was done away with. In 2015, me and my team hosted over 8 hours of panels, and received a plush toy of the convention mascot. We could have, alternatively, opted for a T-Shirt. For all the work we did, it felt like a punch to the gut. When us panelists work on an event, we put countless hours of work into preparing it, and then the nerves that go with putting the event on are completely, in my mind at least, justifiable of receiving a badge or financial incentive of some kind. 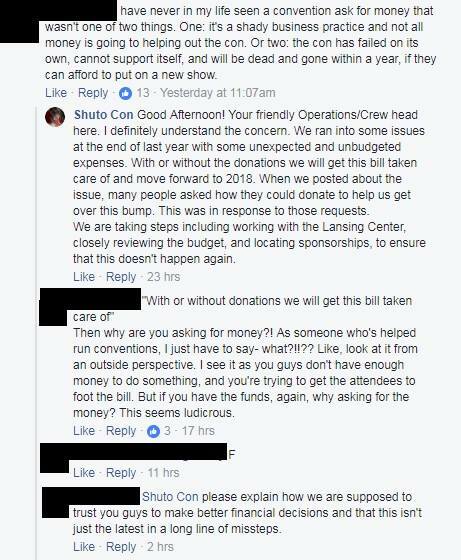 I say financial incentive because, unlike most conventions, Shuto does not accept volunteers. Instead, they pay their staffers minimum wage, because Shuto is a for-profit company. This is, in my opinion, a bad move on the conventions part. Conventions are where many young people get their foot in the door with volunteer work, and volunteering for a convention is the perfect way to get an idea of how to run your own convention or meetup. Since their staffers can get paid to check badges and IDs at the doors to panel rooms and vendor halls, why can’t panelists get some sort of reimbursement? Well, according to a conversation I had on their Facebook comment nightmare, they will be offering better compensation this year. However, it feels like it’s too little, too late. My team and I have brought our concerns up for two years now, and were ignored until other fans brought up even more complaints about the event. Now, all of a sudden, reimbursing panelists is a pressing concern. However, I will give Shuto this. Their tech crew was amazing, and their staffers were more than accommodating and friendly to a newbie panelist. If you’re just getting started into the world of hosting panels, check Shuto out. It might be the perfect place for you to get your footing. My first panel had over 300 people there, thanks to the support of Shuto. This isn’t to say everything about this con is bad. I love the layout of the Lansing Center as a convention venue. Personally, I love the lemonade stand, the walking tacos, and smoothies. There’s good food within walking distance, and the overflow hotels are fantastic. The one we stayed at even let their employees make a little artist alley in the lobby. I also thoroughly enjoyed Mystery Skulls. I was even invited on stage by the con chair to dance in cosplay, which was exciting, and an experience I will never forget. This year, the convention has made attempts to listen to panelists and fix their reimbursement policy, but for me, this is a policy two years too late. I guess the point I’m trying to make with this article isn’t that I’m bashing the convention or the con chair. I get it. Shuto is a for-profit convention and the con chair needs to make a living. She has a young daughter, and struggling with personal relationship issues, of which are of zero importance to my review of this convention. However, I think the convention itself just isn’t the place for me. I think that, as an attendee and as a panelist, my money would be best spent somewhere else. If you enjoy the convention still, and you wish to attend, that’s fantastic, and I hope you have a blast! This convention used to hold a special place in my heart and in my convention line up. It’s where I got my start as a panelist. And with a PR representative to handle PR crisis situations and less of a focus on policing every attendee action via a laundry list of rules, this convention could flourish. Transparency, honesty, and a good PR team is what this con needs to get it back to its former glory.